Ruth Raymond Thone of Lincoln received the 2014 Nebraska Press Women Communicator of Achievement in absentia. She could not be at the fall convention because her husband, Charlie, was in poor health. But she got to hear the award presentation through the magic of cell phones. Ruth is a freelance writer, an author, a community activist and former first lady of Nebraska. She is a Scottsbluff native who worked at the Scottsbluff Star-Herald while in high school. She got her journalism degree from the University of Nebraska-Lincoln and was editor of the Daily Nebraskan. After graduation, she worked at the Lincoln Star and was assistant editor of the Nebraska Education News, put out by the Nebraska State Education Association. In later years, she has written magazine articles, provided commentary for Nebraska Public Radio and written columns for the Lincoln Journal Star, Omaha World-Herald, Washington Post Outlook magazine and The Christian Science Monitor. 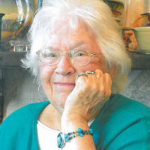 In her 80s, she still writes a regular column for the Journal Star’s Neighborhood Extra section. Through her writing, she has shared her very personal journeys, from being first lady and mother of three daughters to overcoming an alcohol problem, quitting smoking and surviving an aneurysm and a stroke. She has authored or co-authored three books: “Women and Aging: Celebrating Ourselves,” which was based on a course she taught at Southeast Community College; “Fat, a Fate Worse Than Death? Women, Weight and Aging;” and “Being Home,” a collection of her columns. Ruth also has been active in her community and the wider world. 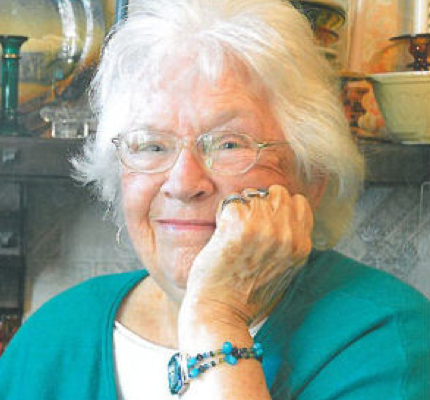 In 1982, she helped found The Gathering Place as a place where people from all walks of life could come together. Located in a home near downtown Lincoln, it offered classes, lectures and events in its initial years. It also was a soup kitchen, serving evening meals for people in need of something to eat. It is now a program of Community Action and serves 30,000 meals annually. She has been a state and national board member of Common Cause, a government watchdog group, and been active in several peace and justice causes. A long-time member of NPW and NFPW, Ruth has spoken at state conferences and has won several awards for her writing. Of course, that’s the tame version of her achievements. The other version is that Ruth has shocked the public on numerous occasions, whether by allowing herself to be photographed sliding down the banister of the governor’s mansion or by refusing to back down on controversial issues. One example happened in 1952, the middle of the McCarthy era, when she was a college student and Daily Nebraskan editor. A committee of the Lincoln American Legion started investigating a well-respected professor. Ruth took them on with fiery words – “The Nebraskan will not stop or slow down its efforts to rid out citizenry of this current fear of thinking, of disputing, of speaking truthfully” – for which she was publicly criticized by the Legion committee chairman. The incident didn’t turn out too bad for her, though. The committee disbanded in the face of mounting criticism and her writing caught the attention of a deputy attorney general, Charlie Thone. He not only quit the committee but ended up asking her out on a date. You know the rest of the story.